Posted on July 4, 2007 under Linux. Sometime back (about a month or two ago), I needed a laptop to serve my computing needs at college. After much thought I settled on the Dell Inspiron 6400. With Dell India, apparently you don’t have any option other than Windows Vista so I had no choice but to go with Windows as the factory loaded OS. However, not really being sold on the Microsoft Vista experience, I decided to finally bite the Linux bullet. After much deliberation, lots of coffee and trawling through forums, I settled on openSUSE as the distro of choice. While most things ran right out of the box, I did do some tweaking to get things working as I wanted. Since I did have a decent amount of trouble figuring out things, I thought a small handy How To would help other people installing openSUSE on this family of Dell computers. The most obvious thing was to get the appropriate ISO image for installation. You can either download this from the web or buy a disk from the site. For those planning to buy the disk, Novell apparently does not retail it in India. I have had extensive (and somewhat interesting) conversations with Novell in India regarding this. Since it was a dual core processor, I got the X86_64 Iso’s from the official site. Next I needed to prepare the hard drive to install openSUSE. Vista ships with a new NTFS file structure. As per various forums online, it isn’t recommended to resize this partition using the partitioner that openSUSE ships with. So I got one that did handle the new NTFS file structure properly. Using it I shrunk my windows partition and freed up about 60 GB in FAT32 formatted space for openSUSE. Installation was dirt simple, nothing more than a little glorified point and click on a wizard. This is one area that openSUSE really scores over other distros, it’s installation is ultra user friendly ! Initially you need to set some standard things like language, time zone and desktop (KDE or Gnome). After this you come to a screen where you can choose the how openSUSE should partition your hard drive as well as what software should be installed.The only changes I needed to make was to point the installer to use the 60GB partion for openSUSE. This can be done in the expert mode. Here I accepted the defaults for dividing the 60 GB partition I had created previously and left the rest of the settings as it was. Once the installation was done, the system rebooted and bought me to screens for setting up the root user. After this you need to configure various settings for the network, hostname, firewall etc. were set up. Since I intended to use the internet through a proxy server on my windows desktop machine, I set the network card with the appropriate IP address and gateway. After this (and this part is the worst part) openSUSE checks for updates online, and this one slow process. Expect this to take quite some time. Once updates (if any) are installed, the last step was to set up a user. The system then rebooted after saving the configuration and I got a nice grub menu. Vista : First of all the Vista partition was correctly recognized and shown as an option in the GRUB menu to boot from. Prior to installing, I had read a couple of posts that involved editing the GRUB menu to make a dual boot system with Vista. However I had to do no such thing, which was a very pleasant surprise. Wi-Fi: While the Wi-Fi card was correctly recognized, I wasn’t very sure that it would work properly. A couple of weeks later I got a chance to test out wi-fi on my college campus. Initially I had some difficulty in the security settings for the card, however after sitting for about an hour I managed to get it connected to the wi-fi hot spots on campus. Bluetooth: The bluetooth card also seems to have been detected correctly,haven’t got a chance to test it out yet. Display: The display initially was quite bad, as the default drivers don’t seem to offer the best resolution. In order to get the best possible display you need to get the latest ATI drivers for Linux. You would need to build a RPM for the drivers using the utility on the site. The openSUSE site has a detailed HOW TO for doing this and installing the drivers and configuring ATI cards. By following those instructions I was able to set up the graphics card properly on my laptop. 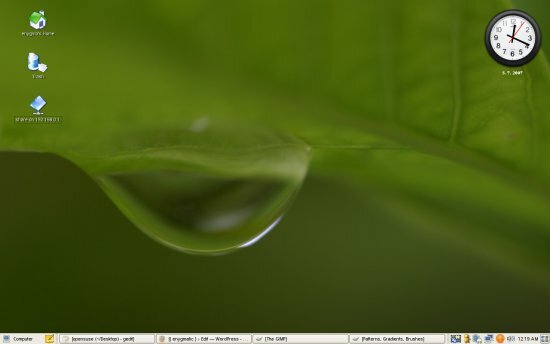 Software: Software can be installed from the various openSUSE repositories. In addition you can use popular repos like PackMan and Guru. A word of caution though, be prepared to wait for quite long while setting up new repositories etc. as YAST is very slow. Video and Sound: Both these work quite well. The only problem I faced was that video playback was extremely distorted. Turning off direct rendering in MPlayer seemed to fix this. I’ve been working on this system for about 2 odd months now, and haven’t faced any problems as such. It hasn’t crashed as such and been quite stable. Linux has really come of age as an mature and user friendly OS. The only obstacle standing in it’s way for wider acceptance is possibly the old urban legend of it being a real pain to setup and use. Once that little step is overcome I guess a lot of people will take the giant leap of faith and fall in love with the cute little penguin. So be a brave-heart, and fall in love today. This entry was tagged under: how to, openSuse. Both comments and pings are currently closed.